“Brooklyn” has a wonderfully told old-fashioned love story that reaffirms that such a movie can still be found amongst all the remakes, reboots and sequels. It is earnest and sweet, not cheesy and pretentious. It has a simple story, consisting of complex characters with relatable emotions, wonderfully directed by John Crowley (“Closed Circuit”) and written by a fantastic screenwriter Nick Hornby (“An Education” and “Wild”), both of whom appreciate the look and feel of classic cinema. There’s a compelling immigrant journey as well as a sensitive coming-of-age tale to be found in “Brooklyn” and a genuine innocence that is lovely. Anyone writing this film off as “Oscar bait” would be sorely incorrect and should make it a priority to check out the best romantic film of 2015. 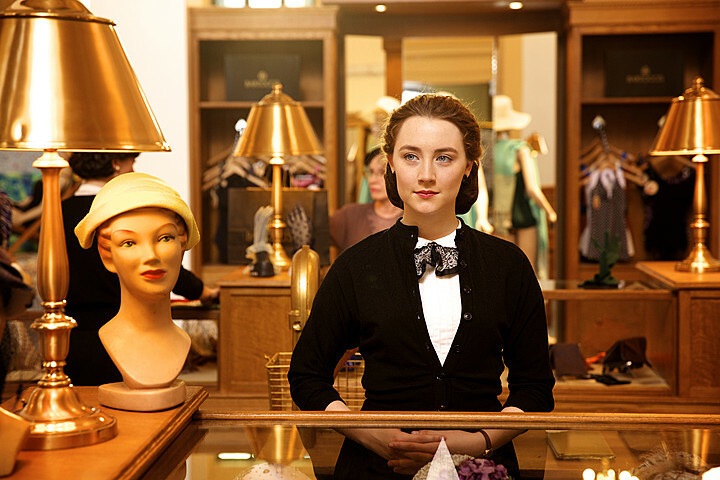 It’s 1952 and Eilis – pronounced Ay-lish – (Saoirse Ronan) is a young Irish woman in Enniscorthy, Ireland, who’s ready to move to the U.S. and experience a change from the monotony of working the local town store, while living with her older sister Rose (Fiona Glascott) and their widowed mother, Mary (Jane Brennan). Through Rose’s help and Father Flood (Jim Broadbent), a kind Irish priest from Brooklyn, New York, a tentative and naive Eilis soon finds herself on a boat to Ellis Island with the hope of new opportunities. Upon her arrival, Eilis is housed in an Irish boardinghouse in Brooklyn run by Mrs. Kehoe (Julie Walters) and is hooked up with a job as a shopgirl in a department store. Despite heartbreaking homesickness, Eilis manages to make a life for herself in this new world and even starts taking some bookkeeping classes at night, something hers sister does back home. One night at a dance, she meets Tony (a fantastic Emory Cohen), a charming Italian plumber who becomes immediately smitten with Eilis. He patiently pursues her and eventually the two connect and fall in love. When a family tragedy calls her back to Ireland, she feels her homeland calling to her and finds herself being courted by available bachelor, Jim Farrell (Domhnall Gleeson), a kind young man who would be a perfect match for Eilis – leaving her torn between the life she recently built and a possible future she could have, both in two different worlds. 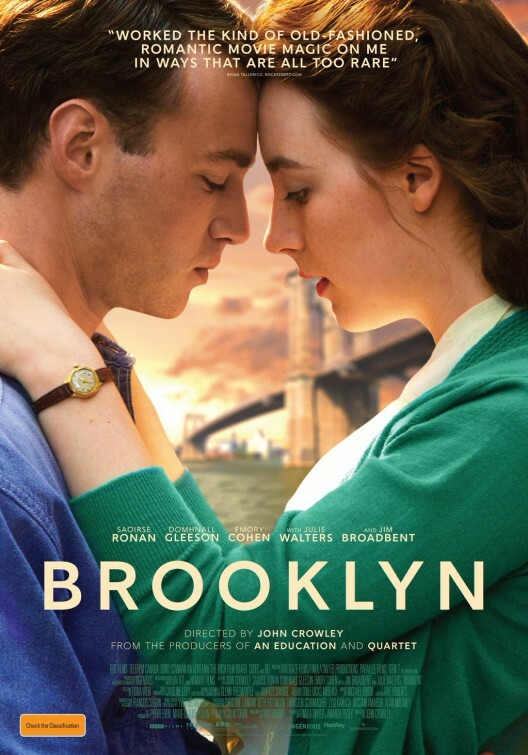 Although it’s a story that follows an Irish immigrant, “Brooklyn” is one of the most American films of 2015. Some may argue otherwise, but all Americans are immigrants to the States in some form, unless they’re one hundred percent Native American. I found myself thinking of my own ancestors coming over from Europe and what they must’ve experienced. Sure, other movies have elicited such a response as well, like the first two “Godfather” movies and Neil Jordan’s “In America” (to name a few), but the sharply honed characterizations here convey such a consideration and respect for the immigration experience, which finds the film undeniably resonating with its audience. Throughout the film, Crowley provides an intelligent and empathetic look at these characters, especially Eilis – as she navigates what it means to leave family and start a new life in a foreign land. It helps that he has exceptional actors to work with as he chronicles this touching story of love, loss and the definition of home. As Eilis, Irish actress Saoirse Ronan (“Hannah”, “The Grand Budapest Hotel”) delivers such internal depth to the role, registering a range of emotions in one single look. She easily carries the film and is a wonder to behold. Watching Ronan grow from an introverted girl to a confidant young woman as she takes in the enormous change in her life is an absorbing viewing experience. It’s a truly exceptional performance – nothing showy or out of character, just intuitive and nuanced work. The stellar acting doesn’t end with Ronan, she is surrounded by authentic and assured supporting performances. Julie Walters and Domnhall Gleeson (who has had an amazing year) and wonderful, portraying characters that would’ve wound up as stocktypes in any other film. Gleeson’s character could’ve been an arrogant cad, but instead he’s sensitive to where Eilis is at and what she’s going through. The fact that both Gleeson and Cohen play solid, stand-up guys, make Eilis’ struggle all the more difficult. Plus, both of these gentlemen compliment Ronan so well and offer a refreshing take on a protagonist’s suitors. Hornby handles Eilis’ arc wonderfully, never rushing through plot points and being mindful of details of both American and Irish life, while also keeping Tony a desirable man, not an easily disposable goon to throw away in the third act. “Brooklyn” avoids literary adaptation troubles by choosing all the right moments to focus on, while Crowley maintains a warmth to the picture, keeping atmospheric period elements intact. During the third act in Ireland, when Eilis experiences her crucial dilemma, Hornby’s writing remains confidently absorbing, allowing the audience to understand the character’s dilemmas, while creating a decent argument for life in either country. She can honestly go either way and we wonder what she will do. 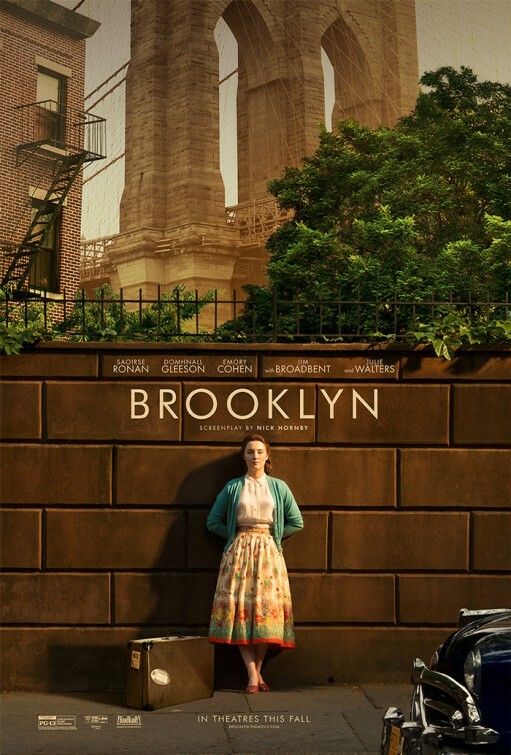 “Brooklyn” locates humor along the way (a movie highlight finds Eilis receiving spaghetti lessons to eat comfortably with an Italian family), and there’s plenty of sweetness as well (Tony has to go to his American-born 8-year-old brother to help craft a love letter). However, none of it ever feels saccharine, treating conflicts with consideration and the bigger picture of cultural immersion with care. “Brooklyn” is tender and welcoming, a story told wonderfully with authentic vulnerability and satisfying characterization. When I first saw “Brooklyn”, it felt like it was hitting all the classic old school love story beats – albeit in an immigration setting – but what made it so much more than that is the outstanding writing. Hornby delivers a sharp and sincere screenplay adaptation of Colm Toibin’s 2009 novel of the same name. I haven’t read the book, but I’ve heard that this film adaptation is actually better than the book. You don’t hear that often, but that doesn’t surprise me considering what a tremendous writer Hornby is. Between his thoughtful script and Crowley’s assured hand at directing, what we experience in “Brooklyn” isn’t just Eilis’ journey, but our journey as well.